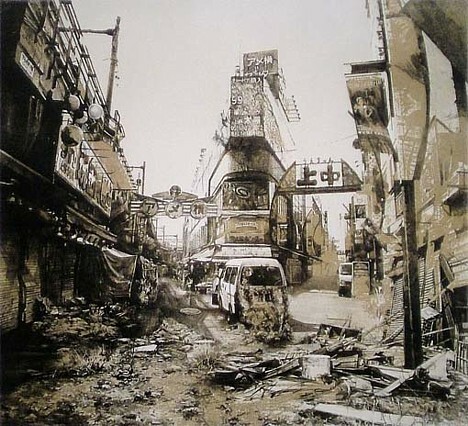 Hisaharu Motoda's "Neo-Ruins" series of lithographs depict the cityscape of a post-apocalyptic Tokyo, where familiar streets lie deserted, the buildings are crumbling and weeds grow from the broken pavement. The antique look of the lithographic medium effectively amps up the eeriness of the futuristic setting. 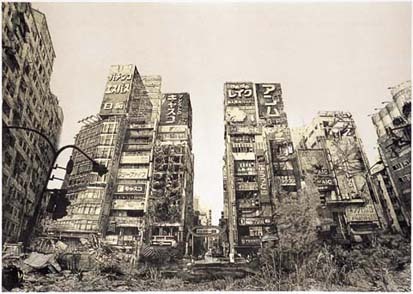 "In Neo-Ruins I wanted to capture both a sense of the world's past and of the world's future," says Motoda on his website. Provocative. 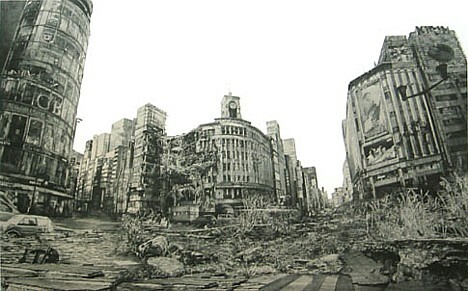 Ginza 4-chome looked much worse after WWII. Great stuff. 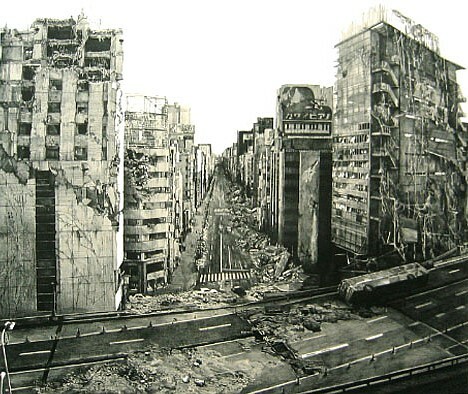 I guess having Tokyo burned, quaked and bombed will make one realize that what's here now is bound to be gone at some point, and it might even be nice to see it just naturally get neglected rather than destroyed. Great lithos. 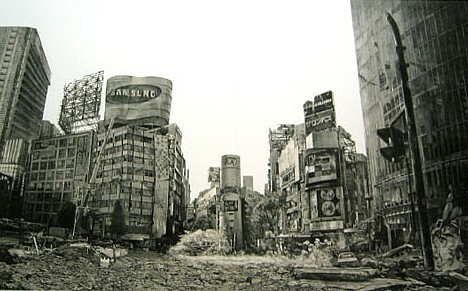 The ruins after the first Global Advertising War. Hiro Nakamura will save the world ! Yattaaaaaaaaaa. the art is amazing and so detailed. Quiet Earth is dedicated to post apocalyptic movies, books, and jericho, with a little helping of scifi and fantasy. Our main aim is to bring the PA genre mainstream since it's really been under the radar for so long, not really defined but always there. We had that smattering of bad mad max rip off's in the 80's but now we've got alot of upcoming stuff that's pretty broad and inventive. We have news on upcoming movies, interviews, reviews of old and new movies (including unreleased flicks) as well as books, anime, television, with a good helping of zombies. Come join our forums and check out our radio show! знакомства г когалым rabler знакомства И увидел что он тоже видит опасность но ничего поделать не. контакты для знакомства fem dom знакомства знакомства только секс Поляково знакомства озинки интим знакомства Рославль mamba знакомства девушка smail небо девять сайт знакомств . as devastating as it is, it has a certain beauty to it. To have real nature come back to a concrete forest is nice.